HawkEye has developed a proprietary line of reflectors to maximize the performance of the emitters and offers a variety of windows to achieve the desired effect. Parabolic reflectors are used for collimating a light source placed at the focal point of the reflector. They project energy of a source at its focus outward in a parallel beam. 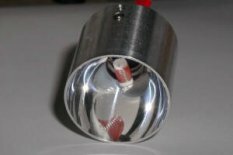 The parabolic profile eliminates spherical aberration, allowing the light source to maintain its wave front characteristics. The use of our parabolic reflectors allows to achieve increase of emitting power 8-14 times. Elliptical reflectors are used for focusing the light source. By having two focal points they eliminate the need for multiple focusing components in an instrument. When emitter is placed at the first focal point, emitting energy will refocus at the second focal point. Windows are used to provide a protective barrier between the IR source and outside environment. Because windows introduce no optical power into a system, they should be selected based on the material transmission and mechanical properties that suits your application.